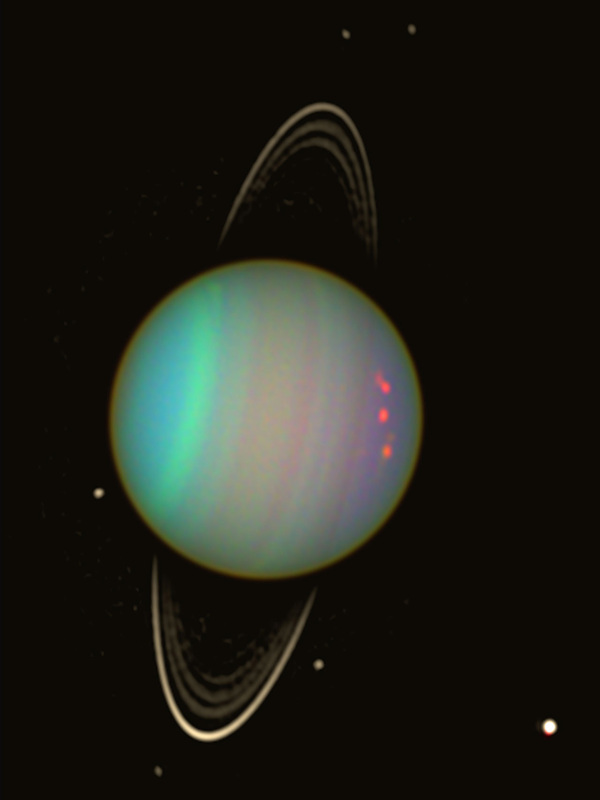 Uranus is one of the 4 giant planets in the solar system, in the sub-category of ice giants with Neptune. Its atmosphere is essentially made up of hydrogen (83%) and helium (15%), with smaller amounts of methane (2%) and ammonia (0.001%). The planet’s spin axis is tilted more than 90°, such that it ‘cartwheels’ on its side with one of its poles facing the Sun for 42 years (half of its orbit around the Sun). 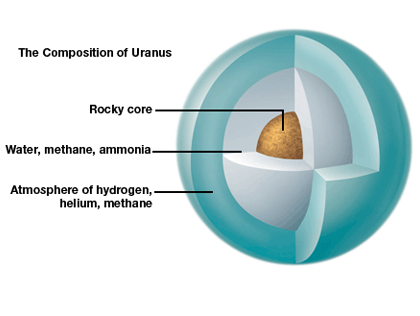 Uranus’ core is the same size as Earth’s and composed of rocks rich in silicates and iron-nickel. It is surrounded by a mantle of ice, ammonia and methane. The atmosphere is made up chiefly of hydrogen and helium, with bands of clouds at different altitudes. Uranus also has a system of 13 very dark rings composed of rocks and dust. Observations by the Voyager 2 probe, the Hubble Space Telescope and astronomers from Earth have identified 27 known moons in the Uranian system. The two largest moons are Titania and Oberon, both spanning more than 1,500 km. 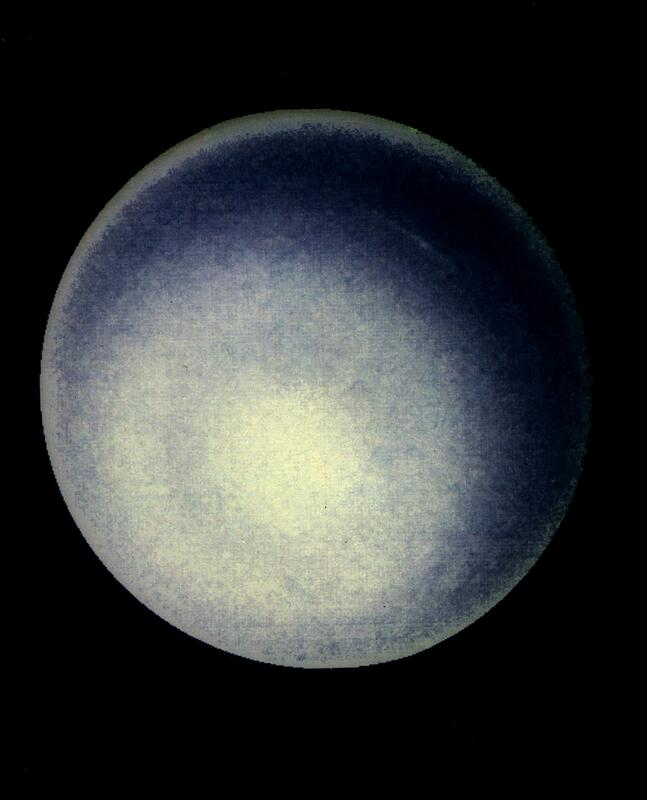 Titania is Uranus’ largest moon and the 8th largest in the solar system. It has giant trenches and cliffs, and possibly a very tenuous carbon dioxide atmosphere. Oberon is a mixture of ice and rock, with a dark reddish surface. Credits: NASA/ESA and Erich Karkoschka, University of Arizona. Voyager 2 is currently the only spacecraft to have flown by Uranus. Launched on 20 August 1977, it flew past the planet on 24 January 1986. 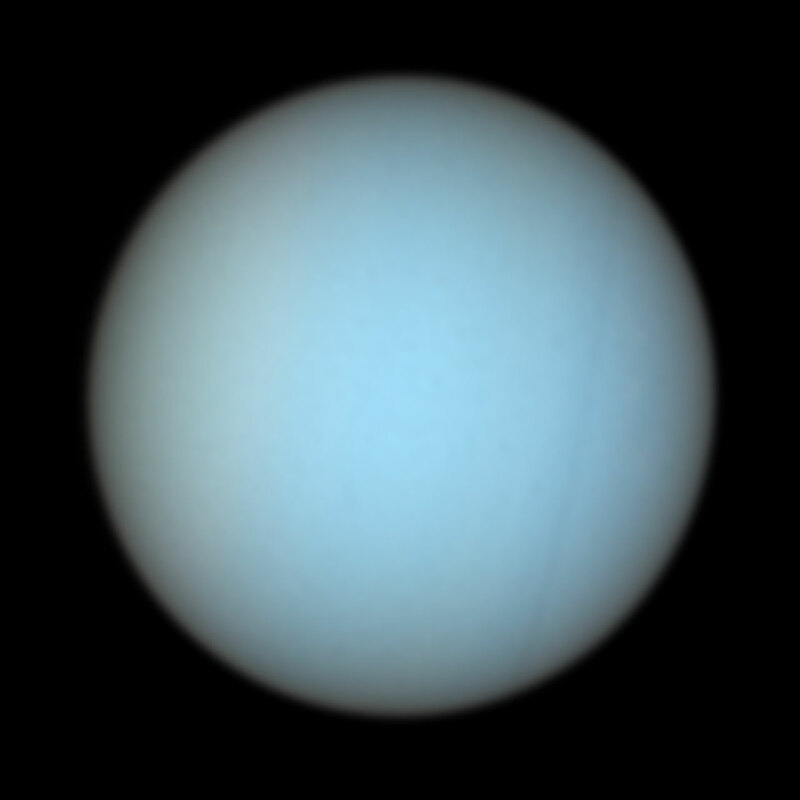 Most of what we know about Uranus today has been deduced from the data obtained by this mission.